"Tone first." That is what is etched into the circuit board of my Egnater Rebel 20. 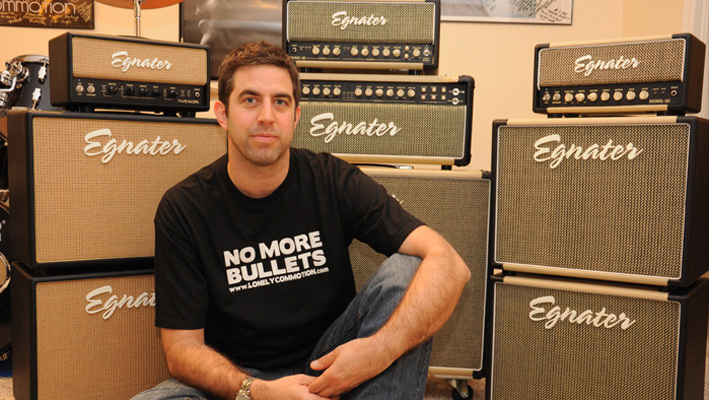 It's a mission statement that prevails in any of the products I've played from Egnater." My name is Eric Mattei and after recording two full length albums; Lonely Commotion (©2007 Socan) & Start Living (©2010 Socan ) I was still struggling to find my “sound.” Like most guitarists; I’d experimented with many brands and models of amps but what I wanted seemed to have been trapped in my head. I could hear a smooth, sustaining and versatile tube amp that complimented and augmented my guitar as if it were another instrument unto itself. I also wanted an amp that was user friendly in terms of maintenance and it had to have features that could create new audio textures for me to work with. I play live venues regularly around Toronto but I would say that I’m like most guitarists out there in the sense that while I’m not on tour playing in huge stadiums I still want quality from the amps that I spend my hard earned money on. Just when I was about to settle on one of the “other guys” amplifiers I happened to meet John of Egnater at a Canadian music industry show. He was easy going, eager to answer all of my questions and when he let me plug into a Rebel-30 I was FLOORED! There it was! The sound that was I after! That day I was so impressed with the Rebel-30, the Renegade and; more importantly, at how John and the Egnater staff were so approachable with a “service first” attitude. It turns out that my first instincts were right on. I’ve gone on to own a Renegade, Rebel 20 & 30 as well as a Tweaker. All of these models have different and innovative features to offer. From the silent recording feature on the Rebel-30 to the Tone shaping switches on the Tweaker and the selectable ohms, power and easy biasing options found on all of my Egnaters; these are just fantastic amps! In addition; John and the people at Egnater are UNBELIEVABLE when it comes to service! Questions are answered quickly; parts are shipped with expedience and they LISTEN to your feedback. Eric Mattei is a self taught; self funded and self produced musician/songwriter who performs his own music. After a period of personal turmoil he recorded his first full length solo album; “Lonely Commotion” (2007). Eric felt he had to tell the story of his journey through music as part of his healing and “Lonely Commotion” embodied this story. In 2010 Eric released his latest effort; “Start Living.” This album shows a new level of song writing, musicianship and production in Eric’s music as he delves global topics about our lives on Mother Earth. When performing live; Eric’s shows are soaked with a passion for the love of music. Covered in sweat and wielding his guitar across the stage; Eric has wowed sold out crowds across Ontario. Eric continues to sell out venues and is gaining momentum with each live performance. Another element of Eric’s growth is represented in his philanthropy. Music literally saved Eric’s life and he decided to extend the healing power of music to his community when he created “Every Note Counts” along with Amy Cross. With each live show, Eric supports charities such as the Friends of Music Therapy Program at Sick Kids Hospital in Toronto and the Daily Bread Food bank. To date; Eric Mattei has raised thousands of dollars for various charities and he continues to raise money with every performance. Eric supports charities such as the Friends of Music Therapy Program at Sick Kids Hospital in Toronto and the Daily Bread Food bank. Thousands of dollars have been raised to date and Eric continues to raise money for charities with every performance.